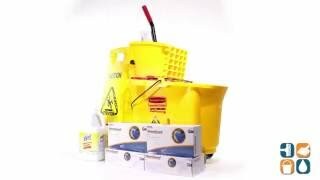 This 35 quart mop bucket features a heavy duty, ergonomic side press wringer designed to exceed 50,000 cycles and non-marking 3" casters. The molded-in wave baffles reduce wave motion, resulting in 40% less splashing for safer, cleaner and more efficient mopping. The mop handle secures during transport, preventing damage to walls. Can be used in conjunction with the Rubbermaid 9C74 Dirt Water bucket (see description below). Ideal for large commercial cleaning jobs. This bright yellow "Caution" multilingual floor safety sign warns of a nearby hazardous area in English, Spanish and French. The two-sided model is ideal for non-obstructive use in narrow areas. The folding design allows for convenient storage and transport on janitor carts. Durable plastic construction will not fade, rust or corrode. Lysol cleaner comes in an economical, concentrated formula that yields 64 gallons of cleaner per one gallon bottle. This disinfectant cleaner can be used on walls, floors, restroom fixtures and surfaces, garbage cans, cabinets, glazed tile, enamel and glazed porcelain. Effective cleans, disinfects and deodorizes. Natural rubber, latex-free gloves are comfortable and economical. They are the ideal replacement for standard latex gloves at an everyday price. These large size (9-1/2") Kleenguard gloves are powder-free, minimizing the drying effects of powder on skin. The ambidextrous design allows users to wear them on either hand while the textured fingertips provide a better grip. Certified for food handling in North America and Europe. Beaded cuffs add strength and are easy to take on and off.